Panama recently oversaw an extensive construction project designed to expand the Panama Canal to give it the ability to handle “Post Panamax Vessels.” Simem S.p.A. , located in Minerbe (VR) Italy, supplied two twin concrete batching and mixing plants, as well as other related equipment. With one plant located in Panama City and the other in Colon, together they produced more than 5 million cubic meters of concrete in approximately 30 months. Each plant has a record output of 720 m3 per hour, with a cycle time of 80 seconds per mixer! The concept of a canal near Panama dates to the early 16th century. The first attempt to construct a canal began in 1880 under French leadership, but was abandoned after 21,900 workers died, largely from disease (particularly malaria and yellow fever) and landslides. The United States launched a second effort, incurring a further 5,600 deaths but succeeding in opening the canal in 1914. Since then the Panama Canal has had a significant impact on world shipping. However, since the Panama Canal opened there have been many changes in shipping and in particular the size of the ships. Today a well-known term for ships that are too big to go through the canal is “Post Panamax Vessels.” Estimations predicted that by 2011, 37% of the world’s container ship fleet would be the Post Panamax Vessels, and without expanding the capacity of the canal it would mean a significant loss of market share. Consequently, a plan was developed to increase the canal’s capacity and also the ship size it can handle. On the 22nd of October, 2006, the plan to build a third set of locks was approved by the Panamanian people through a national referendum. A consortium named Grupo Unidos por el Canal (GUPC), which consists of Impregilo (Italy), Jan De Nul (Belgium), Sacyr (Spain) and the Panamanian company Cusa, was awarded the contract for the expansion of the Panama Canal in the autumn of 2009. The work included the excavation of several million cubic meters of earth and rock, and the production of more than 5 million cubic meters of concrete to form the new locks and the water recycling basins. The work was scheduled to be completed by the autumn of 2014 for the 100th anniversary of the Panama Canal, making it necessary to pour the concrete in a period of about 30 months. After concluding discussions with GUPC regarding the supply of plants for production of the concrete, Simem S.p.A was awarded the contract to deliver these plants. 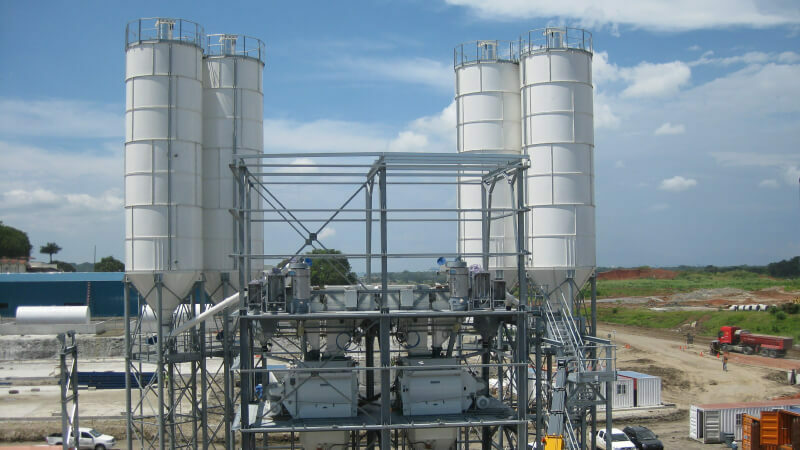 Many factors had to be taken into consideration for the design of these concrete plants. For instance, the raw material requirements, the output capacity, and the concrete placing temperature. 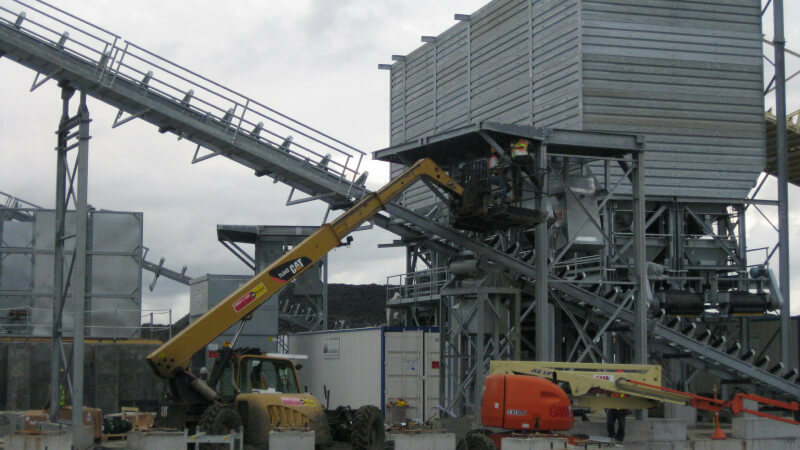 In the end, the plant layout was based on a shared aggregate section serving two independent mixing towers, each containing two Simem MSO6000-HLS twin shaft mixers with an output capacity of 4.5 m3 of compacted concrete per batch. The combined capacity of the two mixer towers, with a total of 4 mixers, is 720 m3 per hour. For the concrete production, five different types of aggregates were utilized, three fractions of stones and two fractions of sand. Due to the concrete placing temperature requirement of 10° C in an area with a typical ambient temperature of 35° C and higher, the complete system also contained a considerable cooling solution. To ensure the placing temperature was maintained, the aggregate was loaded into the bins on a demand system. The control system of the concrete plant sends continuous consumption information to the aggregate loading system, which loads the bins with the different aggregate fractions as required. The aggregate is cooled during the loading process into the aggregate bins, which have a total storage capacity of 750m3 with a capacity for each of the five fractions for one hour of production. 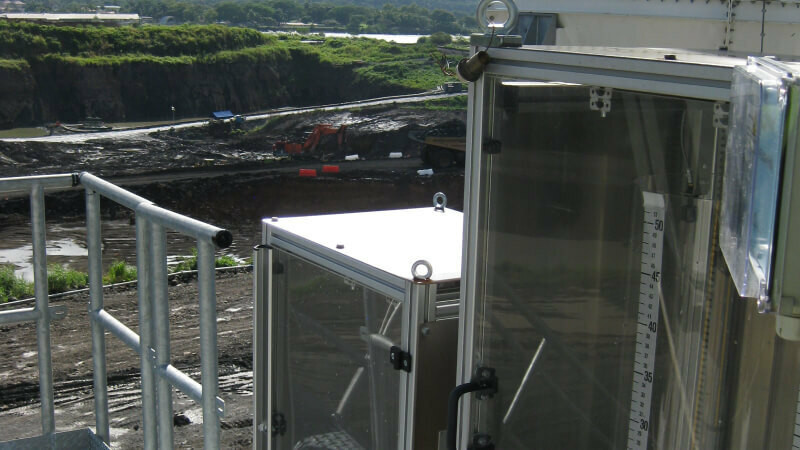 The complete aggregate section is enclosed with insulated panels and cold air is then blown into this enclosure to control the temperature of the aggregate. Cold air is also blown directly into the aggregate bins for some of the material fractions. In order to keep up with the cycle time of 80 seconds, it was necessary to use one aggregate scale for each aggregate fraction. Five scales served mixing tower A and another five served mixing tower B. 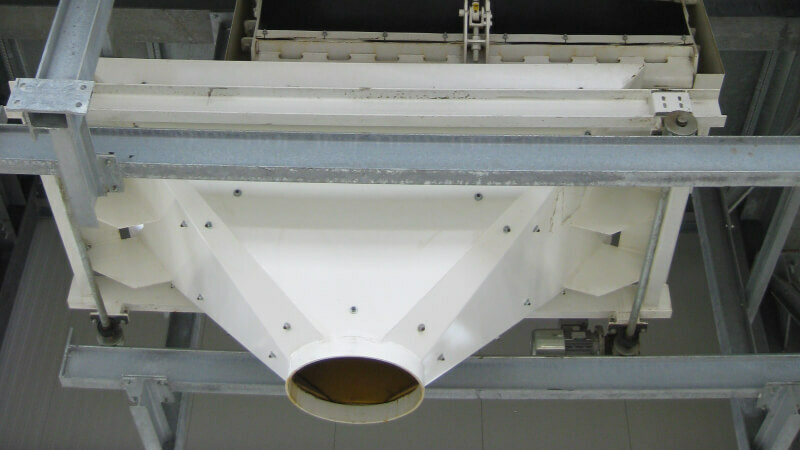 The aggregate is transported from the scales to the holding hopper above each mixer with a high capacity extraction belt and an inclined belt before passing a diverter chute into the selected holding hopper. 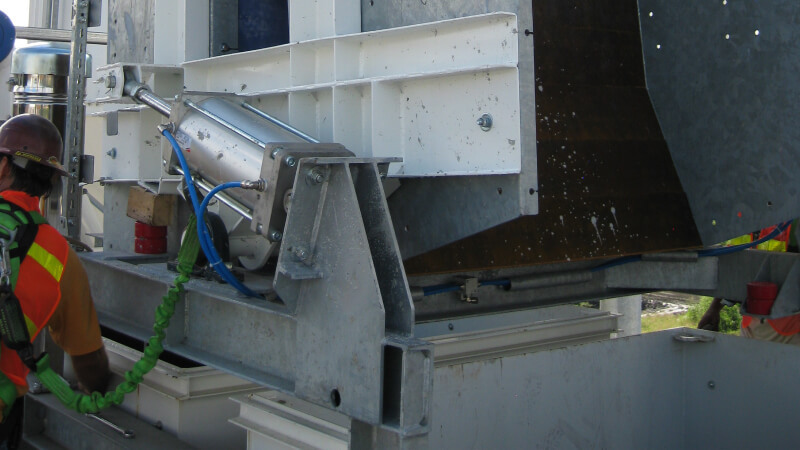 The controls allow for the consecutive batches to be on the same belt conveyor spaced out by the use of timers and material sensors in order to give the diverter chute time to change between the holding hoppers. Each mixing tower is served by a double set of ice scales. The ice is discharged onto the inclined aggregate belt conveyor. One type of cement and one type pozzolan were used in the mix designs. For each mixer, there are two 115m3 storage silos. These are filled from large cement storage silos by a pneumatic conveying system also supplied by Simem S.p.A. cement feeding from the silos to the scales is done by the use of screw conveyors. There are two cement scales per mixer, one for cement and one for pozzolan to ensure the production capacity requirements are met. Water is also dosed by the use of scale, and the plants are ready for use of clean water (chilled) and slurry water. Slurry water was available from the BetonWash 25 concrete reclaimers supplied by Simem S.p.A. Three types of admixtures will be utilized and they are dosed with the use of 2 scale units. One unit with double chambers and the second one with a single chamber. Due to the different volumes of the admixtures, two units were supplied to ensure the required accuracy. The MSO 6000-HLS twin shaft mixers are equipped with a fully automatic high-pressure cleaning system to ensure a quick and easy clean up. For consistency control, a mixer moisture probe combined with power consumption readings is utilized. The mixer moisture probe is not used in the traditional way of calculating the water requirement, but instead as an instrument to verify the moisture level in the mix towards a reference number. Most of the concrete produced was loaded into open bed agitator trucks with a capacity of 9 m3, making it necessary to double batch to fill the truck. In order to reach the required capacity, each mixer was equipped with a holding hopper able to hold one batch, thus ensuring that the truck movement would not delay the mixer discharge. The plant is also equipped with an automated moveable loading chute if traditional truck mixers are being used. All equipment was designed and produced by Simem S.p.A. in Italy and shipped to the sites. Each mixing tower is considered a separate plant, and is equipped with a computer based control system, using soft PLC with distributed I/O’s throughout the plant to simplify the installation. All electrical panels have climate control to ensure a problem free operation. The equipment has been installed under the supervision of personnel from SIMEM S.p.A.’s subsidiary in USA, Simem America Corp. The installation began at the end of June 2010 and the first batch of concrete was produced from plant “A” in Panama City, in mid-November of the same year. Starting in January/February 2011, regular production began with a gradual increase in volume until full capacity is reached and required in March/April of 2011. The full Panama Canal expansion project was opened on June 26, 2016.